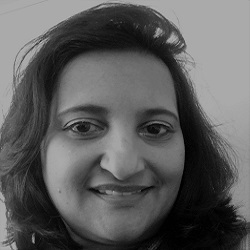 Dr Aneesa Moolla joined HE2RO permanently as a Senior Researcher in January 2017 after working as a Consultant for HE2RO in 2016 with a specific focus on offering technical expertise in qualitative data analysis and training. She started her varied professional career with an Oral Hygienist qualification obtained at the University of the Western Cape and has extensive clinical and academic experience in the field of oral health care and has also previously worked extensively with the Red Cross Flying Doctor Association to deliver dental care to children in remote rural areas where healthcare was totally inaccessible. She also holds a BA Clinical Psychology (Honours) degree and a PhD in Psychology of Education obtained from the University of Johannesburg. Her Masters and PhD research work focused on aggression and resilience in street children culminating in the design of a psycho-educational model to facilitate their mental health for which she was awarded both the Best Thesis and Chancellors Gold Medal Awards. In her professional work capacity, this research has broadened out into the fields of oral healthcare, traditional medicine, HIV prevention, treatment and care. Dr Moolla has worked across all sectors and has gained a diverse set of expert skills in dental private practice, corporate organisations, health systems strengthening, research institutions and clinical research trials. She also currently lectures at the University of Witwatersrand in the Dental Division where she combines both her Psychology and Dental qualifications in the training and clinical supervision of dental students. She has a special interest in Ethics and has participated successfully in the UNESCO International Bioethics Teachers Training Course. She now also designs ethics course modules as a consultant and is also regularly invited to lecture at various conferences and seminars on Ethics in Healthcare as part of the continuing professional development of healthcare professionals.